As I explained in the previous blog posts, from a manageability perspective, you should not change the patch level of a deployed Oracle Home, but rather install and patch a new Oracle Home. With the same principle, Oracle Homes deployed on different hosts should have an identical patch level for the same name. For example, an Oracle Home /u01/app/oracle/product/EE12_1_0_2_BP171018 should have the same patch level on all the servers. 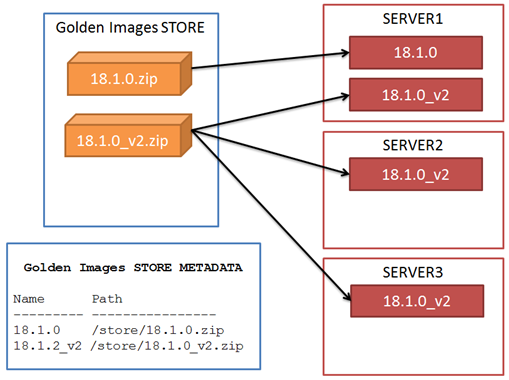 For this, we will use a Golden Image store (that could be a NFS share mounted on the Oracle Database servers, or a remote host accessible with scp, or other) and a metadata store. When all the software is deployed from golden images, there is the guarantee that all the Homes are equal; therefore the information about patches and bugfixes might be centralized in one place (golden image metadata). Here, the script ohctl takes two actions: -c (creates a Golden Image) and -i (installs a Golden Image)). Cleans up logs, audits, etc. By following this pattern, Oracle Home names and paths are clean and the same everywhere. This facilitates the deployment and the patching.